Lock in a great price for The Mortal Man Inn - rated 8.6 by recent guests. Another great stay at the Mortal Man. We were made to feel very welcome and the staff went above and beyond to accommodate us and our dog! Food and wine was top notch and very reasonable for the area. 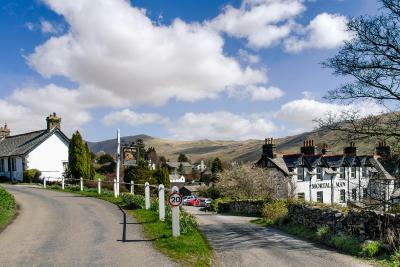 The pub is in the remote village of Troutbeck - very quiet. Food is good pub food. Always walked passed and have enjoyed the odd drink however the stay was pleasant just what you need after a good walk. Staff friendly and welcoming. Bed was extra comfy and room had what you would need for a one night stay. The room was very comfortable and the view was very good. The evening meal was brill we had a fish platter for 2 we couldn't manage a sweet! A lovely roomy hotel in one of the most beautiful parts of the lake ...great views....very friendly staff especially the barman. Dogs were also welcome. Although we only had a small double it was of a high standard. Very good value. Brilliant staff, food, location, beer, views, room, atmosphere......we loved our stay here! The room, food etc were all superb. However, the level of care and concern from every member of staff was excellent. In addition, the cultured live event on Thursday night was an unexpected bonus, for which we were very grateful. The staff were amazing made the night 😊, the views are stunning all round, good quality food made to your liking with no trouble at all. Good pub vibe with the locals. You've got to understand that this hotel has its origins in the 17th century so don't expect huge bathrooms but what you can expect is a warm welcome, great staff, lovely food, great beer and real olde world atmosphere. 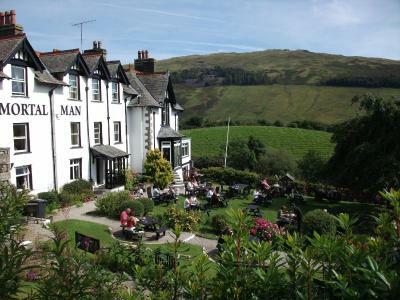 One of our top picks in Troutbeck.Situated in a beautiful part of the Lake District, The Mortal Man offers stunning scenery, and delicious food made with local produce. Bedrooms have magnificent views. The country house-style rooms at The Mortal Man Inn feature TVs, radios and tea/coffee-making facilities. Bathrooms have both baths and showers. 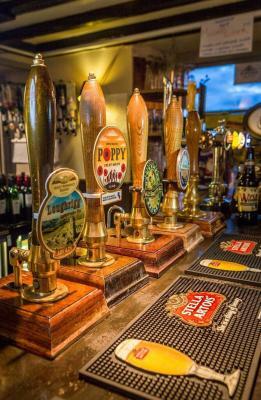 The traditional pub has a bar menu, a range of local ales and a large beer garden with plenty of seating and countryside views. Guests can enjoy fine cuisine and panoramic views of Lakeland mountains in Anthony's restaurant. Fishing and water sports are available on the lake, and there is horse riding just down the road. Ambleside and Windermere are both less than a 10-minute drive from the property, and there is free parking on site. 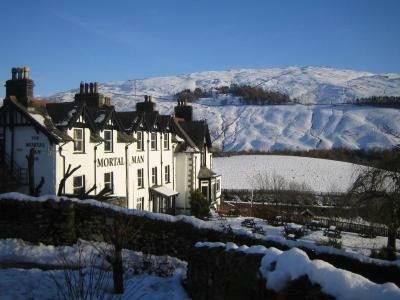 The Mortal Man Inn has been welcoming Booking.com guests since 25 Mar 2011. 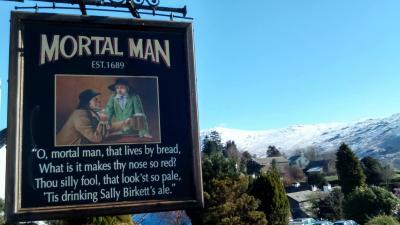 When would you like to stay at The Mortal Man Inn? This double room features an electric kettle, and en suite bath and shower. Wonderful double aspect views of the Troutbeck valley, looking all the way to Lake Windermere. Being on the top floor these rooms have fantastic views down to Lake Windermere, they have both bath and shower in the bathroom. The beds can be linked together on request. This double room has a beautiful view down the valley. The en suite bathroom has a shower over the bath. House rules The Mortal Man Inn takes special requests - add in the next step! All children from 2 to 16 years are charged GBP 10 per person per night for extra beds. The Mortal Man Inn accepts these cards and reserves the right to temporarily hold an amount prior to arrival. A continental breakfast included in the price. Please note only the Four Poster Room and Twin Room can take 1 extra bed each. Great atmosphere, excellent food, amazing people! Could do with being redecorated. The breakfast was ok but filter coffee would have been nice and the continental breakfast could be inproved with the addition of some cheese and meat. The cooked breakfast was very nice but was an additional charge. Only a small detail..would have liked a tray for the kettle and coffee/ tea facilities. Great area, lovely staff, beautiful location. Perfect place for a break! Great location with Lakeland views. The Lake District wind and rain wasn't what we ordered - any chance of a refund?! Room a bit tired, bathroom likewise. At the price we paid, we shouldn't have been asked for more money for a cooked breakfast. It was an expensive room. Views and location excellent. Friendly staff.